If you'd like to do something a little different with your aquarium there are few fish more exotic than arowanas. Also known as dragonfish and bony tongues, they have traditionally been associated with dragons and thought to bring good luck and wealth. Considering their striking appearance, with elegantly delineated scales and impressive barbels, it's easy to see why. Many arowana breeders participate in shows and competitions to celebrate the beauty of their fish. Arowanas grow to be as much as three feet long, so if you're going to keep them you'll need a good sized tank. They should be kept in groups of five to eight; smaller groups tend to result in more aggression. Because of their aggressive temperament they should not be kept with fish much smaller than themselves, but they can get along well in community tanks with fish like cichlids, oscars and plecos. They are sensitive to water condition, so you'll need good filtration. They also have a tendency to jump, so you'll need a secure aquarium hood. There are several species of arowana, originating from South America, Africa, Australia and Asia. Asian arowanas tend to be the most highly prized, but they are an endangered species and it is illegal to trade them in unless they are over thirty years old or captive bred (in which case they are marked with microchips). 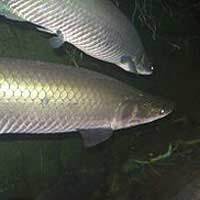 Silver Arowanas - These are the most common choice for aquarium hobbyists, but they are also the largest, sometimes growing to four feet in length. Black Arowanas -Almost identical to silver arowanas but for their colour, these fish are slightly less hardy. Australian Arowanas -These look very similar to their Asian equivalents but are far less expensive. Pearl and spotted varieties are available. African Arowanas -A distinctly different shape from other species, these fish are available in a variety of subtly blended colours. All arowanas are carnivorous and strongly prefer live food. For best results they should be provided with a highly varied diet. Shrimp, prawns, mealworms, crickets, centipedes, krill and frogs are all suitable foods, though any sharp pieces should first be removed and live animals should be quarantined first to avoid the introduction of parasites. Arowanas enjoy eating smaller fish but should not be fed these too often, as a build-up of fat in their bodies can lead to health problems. Many arowanas will take pellet food, but this is not sufficient on a daily basis. Individual preferences vary, so be ready to experiment to see what your arowanas like. Because arowanas are so active and tend to swim fast, you should avoid having any sharp objects in your aquarium on which they might injure themselves. Fast flowing water will keep them in better condition as it will discourage them from rubbing against the glass. Arowanas in aquariums often suffer from protruding, drooping eyes due to looking downwards a lot, which they should not do in the wild. A good way to avoid this is to keep a brightly coloured ping pong ball floating on the surface of the water. This will distract them sufficiently to keep their eyes in good condition and they'll enjoy playing with it, giving you something extra to enjoy watching. Arowanas are extremely difficult to breed in captivity, especially in an aquarium. They spend months courting to develop pair bonds and spawn just once a year. If they do breed successfully, the male will protect the eggs, and later the fry, in his mouth. However, the female may eat them, so it is best to separate her at this stage. Keeping arowanas can be a challenging experience and is not recommended for beginners, but once you know what you're doing you can derive a great deal of pleasure from getting to know these fascinating fish.